Galusha A. Grow was a Congressman from Pennsylvania (Democrat, Republican, 1851-63, 1894-1903). Grow succeeded his legal mentor, David Wilmot, in Congress at age 27. He had a strong will and weak health; he was an indefatigable and fearless campaigner. He favored easy land and hard money. A bachelor attorney who preferred policy to politics, politics to the law, and workers to capitalists, Grow later found a career in business. He sometimes took positions out of sync with Pennsylvania’s pro-tariff, anti-immigrant electorate. 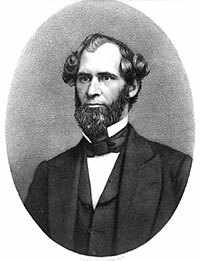 Grow was an ally of Thaddeus Stevens in the House and an opponent of Simon Cameron in Pennsylvania politics. As a result, his relations with President Lincoln were courteous but not particularly close. 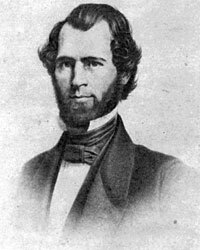 Grow served as Speaker of the House (1861-63) after defeating Frank Blair for the post Grow was particularly relentless in his support of Homestead legislation which would provide free land for Western migrants. He helped guide the Homestead Act to enactment in 1862 after nearly a decade of uninterrupted lobbying for the measure and support for immigrant access to land. His support for the Homestead bill led him into conflict with the South and cost him early races for House Speaker—especially after he was involved in a melee on the House floor in 1858. Grow did not send many letter to President Lincoln, but in January 1861, he wrote President-elect Lincoln: “My colleagues having signed and sent to you a recommendation for Hon. T[haddeus]. Stevens of Pa for a place in your cabinet and not having an opportunity at the time of signing I take this occasion to assure you that I fully concur in their endorsement.” Grow added: “In closing permit me to express the earnest hope, as well as the desire of a majority of republican members of Congress, that you may find it compatable with your sense of duty to secure the services of Mr [Schuyler] Colfax as P. M.” Genl.”8 Neither man received the requested appointment. Grow lost a reelection bid to the House in 1862 because of his commitment to Radical Republicans. In subsequent years, he found his political ambitions stifled by both the Curtin and Cameron wings of the Pennsylvania party. He returned to the House of Representatives three decades later in 1894 after many unsuccessful quests for Congress, the Senate, the governorship and the vice presidency. Robert D. Ilisevich, Galusha A. Grow, p. 205. Ilisevich, Galusha A. Grow, p. 205. 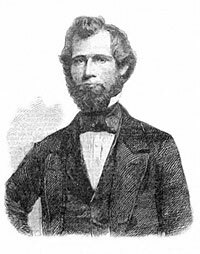 Noah Brooks, Mr. Lincoln’s Washington, p. 112 (February 15, 1863). Douglas L. Wilson and Rodney O. Davis, editors, Lincoln’s Informants, pp. 206-207. Ben Perley Poore, Perley’s Reminiscences, p. 101. Michael Burlingame and John R. Turner Ettlinger, editors, Inside Lincoln’s White House: The Complete Civil War Diary of John Hay, p. xi. Ilisevich, Galusha A. Grow: The People’s Candidate, p. 205. Abraham Lincoln Papers at the Library of Congress. Transcribed and Annotated by the Lincoln Studies Center, Knox College. Galesburg, Illinois (Letter from Galusha A. Grow to Abraham Lincoln, Friday, January 18, 1861).